Although pumpkin jam is not typically something you will find on average supermarket shelves, even in the fall season, it's an autumn favorite in specialty gourmet catalogs. And if you are pumpkin picking or apple picking in season and stop into an adorable farm store with fresh pies, you're likely to find cans of pumpkin jam for sale as well. Some places might call it pumpkin butter but, if you read the ingredients, they are probably similar to those in this jam recipe. This jam is not overly sweet and absolutely perfect on virtually all types of breads and even in some desserts. Try spreading it on bagels, muffins, toast or biscuits. Spoon some over pancakes and even use in place of mayo on a chicken or turkey sandwich! It's rather simple to make and almost foolproof. If you're craving pumpkin pie, a bit of the pumpkin jam might help to curb the craving and, of course, the jars make great holiday gifts. In a medium saucepan, combine the pumpkin puree (be sure to use plain pumpkin and not pumpkin pie filling), clove, cinnamon, ginger, allspice, sugar, lemon juice, salt and vanilla extract on medium-high heat, stirring constantly. Bring the mixture to a boil and then reduce the heat to low. Allow the mixture to simmer for about 45 to 60 minutes. Check and stir frequently to prevent it sticking to the bottom of the pan. If this occurs, lower the heat even further. When making jams and jellies, it is best to use a non-stick pan instead of stainless steel or copper bottom pans to avoid a reaction with the metals. After 45-60 minutes, the mixture will be thick and a clear orange color -- almost translucent. Taste the jam to see if it needs any additional salt. Then pour it into sterilized jars and seal once cooled. 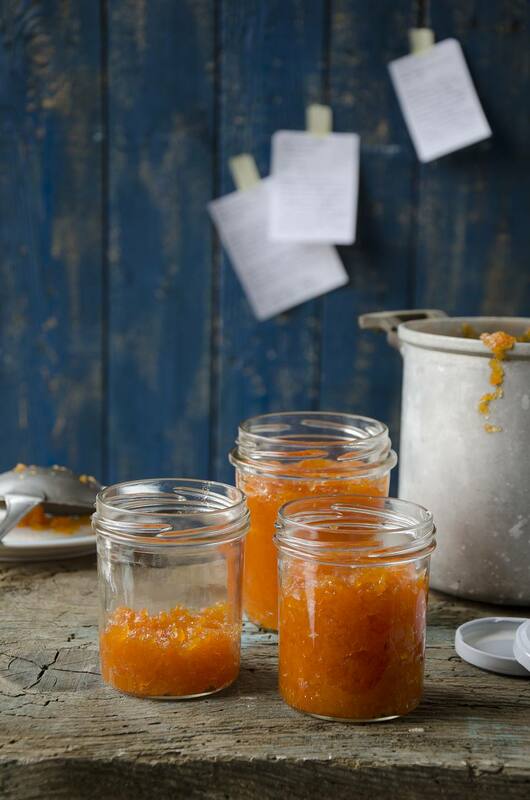 Note that if you are not preserving, you can also place the jam in unsterilized containers and store in the refrigerator but be sure to use within a week or two. If you are a first time canner, it is important that you follow canning safety procedures very carefully. If not, you may put yourself or others at risk of food poisoning and also risking premature spoilage. Note that if using fresh pumpkin, choose one that is anywhere from 2 to 3 lbs. and roast for an hour in a 400 degree oven until tender. Scoop out the seeds and then spoon the flesh into the pot as you would with canned pumpkin puree. For some fun variations, try substituting pure maple syrup for some of the granulated sugar for a more autumnal flavor.